Polishing your silver is as easy as a wave of your hand with our Silversmiths' Gloves from Hagerty - you simply rub the tarnish away. Made from heavy-gauge terry cloth coated with Dry Silver Polish, the pair helps keep your silver in tip-top shape while your hands stay unsoiled. Can you use the gloves to polish silver jewelry? The Hagerty&reg; Silversmiths'&reg; Gloves are specially treated with Hagerty Dry Silver Polish. This polish is formulated to clean sterling, silverplate, and gold. Safe on 24k gold, this extra mild polish does not contain harsh abrasives. However, these gloves are typically used for larger polishing jobs such as serving pieces. 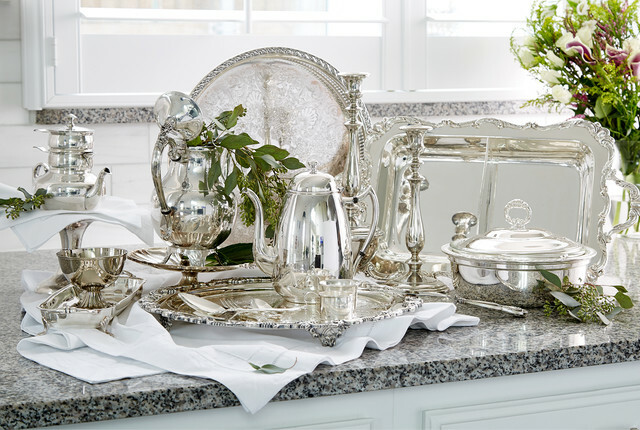 For silver jewelry care, please see product recommendations below. Our Silversmiths' Gloves by Hagerty are available in a single, one-size-fits-most size. Our Hagerty Silversmiths' Gloves are not washable. We recommend our Hagerty Silversmiths' Spray Polish for replenishing our Silversmiths' Gloves. Will this work with silver plated fine china? We do not recommend using it for a Plated Fine China.